Here you can find a strain description about Arjans Strawberry Haze (Greenhouse) and also some user-based reviews and infos directly from the SeedFinder (if available). You can also find the offers and auctions here if Arjans Strawberry Haze (Greenhouse) cannabis seeds are on stock at MyCannapot right now. Effect: Very mild body effect, strong cerebral high. Very creative and social. Voted best strain at the Green House V.I.S. Smoking Panel 2005. 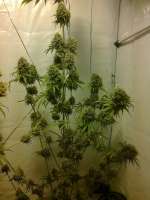 Flowering indoor: most growers harvest after 10 weeks. A week longer will allow maximum flavour. Yield 500 to 600 gr/sqm. Initiation of flowering onto around 25 cm. - Final Height onto around 111 cm. It is not the hevies producer, but the ratio of buds to leaves is very good and it takes about 65 days to finish. It slightly reduces blood pressure, so its good for people who have high blood pressure. Strawberry aroma appears around week 4. Its very gently to smoke ..sweet and soft. The affects are slightly above average. hempi Hatte nur 1 fem. Seed, von daher nur ein Pheno (#1). die es aber in sich hatten...fruchtig-nussiges Haze-Aroma, sehr lecker! Der Turn ist up-high ohne wenn und aber. Wächst schnell und in alle Richtungen, muss unbedingt gestüzt werden. Auch bei relativ viel Stress keine Zwitterei entdeckt. Fazit: Geschmack&Turn sind ausgezeichnet, der Ertrag nicht. hazeraucher Sehr Kompakte Buds! Wenn man einen schönen Herbst hat werden sie sogar (auf dem Balkon) Outdoor bis zur Ernte reif! Sehr nussiges und fruchtiges Aroma! Arjans Strawberry Haze (Greenhouse) is not available at our shop at the moment!